The corporate banter about the ROI and risks of using social media as a pure form of advertising is getting old. I’d like to address the cynics and vent some of my frustration with those who wish to continue their romance with traditional advertising. After all, it is almost 2015 and Apple has recently released it’s 6th iPhone. I’m not going to bore you with facts and figures about how and why social media is taking over advertising, that would be too easy. When you look around, what do you notice everyone has in common? They are carrying a powerful device that connects them to the world and they look at it frequently; it’s a smartphone, the billboard of the future. Our mobile phones are fully capable of serving us with instantaneous information on just about anything you could think of. Have you ever been watching TV and picked up your phone only to get sucked into the social media world? Successful marketers acknowledge this consumer behavior and capitalize on it as a golden opportunity to sell. Powerful advertisements were deliberately orchestrated through mobile devices to subconsciously persuade, convince or otherwise sell an idea, product or service. Ultimately, whether or not you feel you’ve been persuaded to “buy” as a result of social media is irrelevant at this point. You would be sadly mistaken to fall into the belief that YOUR life hasn’t been impacted in one way or another by social media. 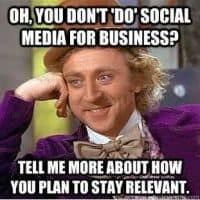 If you are in business and you’ve been on the fence wondering whether or not to jump on the social media bandwagon, what interested you in the first place? Was it a desire to increase revenue, network, or tap into new markets? Or was social media simply a check in the box. I’ve seen small businesses lay social media to rest shortly after half-vast attempts trying it out. In this case, the old adage applies that “if something is worth doing it’s worth doing right”. Have you ever wondered why some businesses are crushing it on social and why others fail? Successful social media advertising is more than simply creating posts. Content marketing requires careful planning and follow through. If your message isn’t relevant or as impactful as it could be, you’ll be lucky to make it into your customers news feed. Businesses who embrace authentic content marketing will ALWAYS win the news feed war. Your reputation is what others are saying about your company, listening to these conversations and engaging with them is an equally important task in making your business succeed. Those who are missing any or all of these things will eventually fade out over the long term; this shouldn’t be you. As marketers, social media has given us access to unprecedented real-time data to find out exactly who our customers are. Social data gives us on demand access to information about their buying habits. How much would you pay to nail down the profile of your ideal buyer? An investment in these types of solutions make social media increasingly relevant to the long and short term success of your business. The bottom line is simply this, we live in a fast paced culture. Society is rapidly changing both socially and technologically. As we evolve, so should the way we do business. Social Media and mobile technologies are still in their infancy, but will undoubtedly continue to evolve and provide mankind with solutions. Often times we revert back to our old ways of business simply because of familiarity. When we become comfortable, we miss out on opportunities. More importantly, we forfeit the experience of success that comes as a result of perseverance. These innovative challenges are not easy but they are necessary to succeed in business and marketing today. 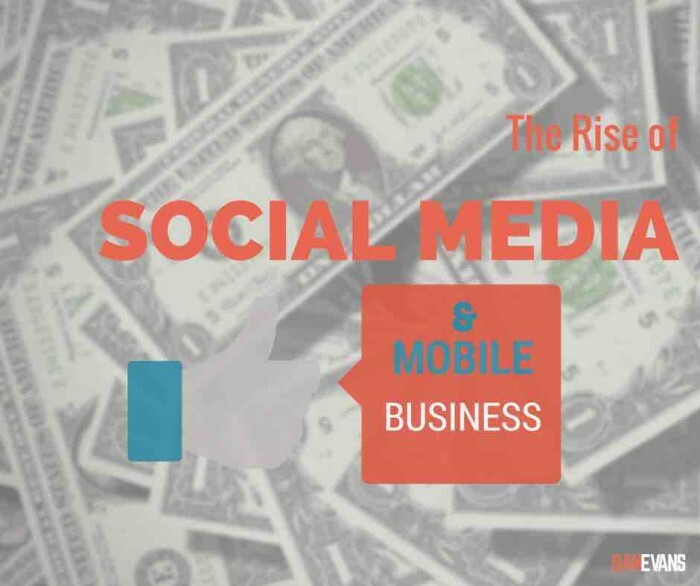 The rise of social media and mobile tech is here to stay. It just makes sense, are you onboard? Great post Dan. If social media only showed us the demographics of our users that in itself is a great ROI. Thanks Kris! I appreciate the share as well.